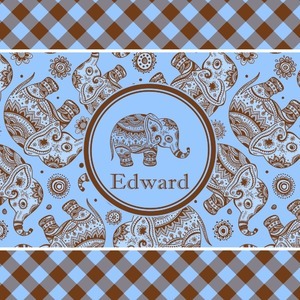 This design with gingham and baby elephants is elegant and versatile. We chose to use baby blue and brown for our colors, however the design is fully recolor-able; so you can change the both the colors to any color combination that you like. We chose the angled gingham for the top and bottom, but you have the choice of straight gingham or any other pattern in our system that you like. Our baby elephant pattern are available in 3 different styles - we chose style 2. We opted not to have a ribbon and chose a simple round label with a graphic of the elephant and the personalization below the elephant graphic.